There’s cracks all over the house, tables are leaning, your doors and windows won’t open and look lopsided, and on top of that, your basement walls are bowing! What could be worse? In the eyes of a homeowner, almost nothing. If you have one or more of these problems, chances are, you have serious foundation problems. Foundation problems can be caused by a multitude of outside conditions. Too much water in the soil, too little water, unstable soil, pressure from the ground, and many other factors can contribute to foundation problems. A good solution to foundation problems are resistance piers! At Atlas Piers of Atlanta we’re here to bring you the best resistance piers Atlanta service! 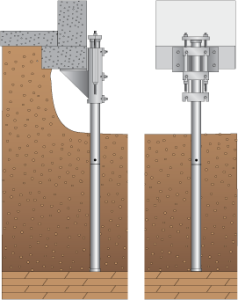 Resistance piers are steel piers that are shaped as a sort of “L.” They attach onto an already existing wall to help support that wall. They transfer the weight of the structure to much deeper bedrock, where the weight can be supported much more easily. After the piers are installed, brackets are attached, to create maximum support. The process usually goes like this: holes will be dug for the piers, they will be driven to the specified level underground, brackets will be attached, and then you’re done! The piers will start to support your home as soon as they are properly installed. There are many benefits to resistance piers. They are economically friendly, and also install quickly. Heavy machinery isn’t required for the job, they can be installed in compact and cramped spaces, and they won’t ruin the look of your home. Resistance piers are ideal for all soil types, as well. If you need resistance piers Atlanta or resistance piers Georgia, call us now! We’ll work with you and make sure that your home is safe and supported! We’ll also make sure that you get your product you deserve, so you won’t have to worry about your wallet! If you need resistance piers Atlanta, call us now! We also specialize in many other foundation repair services. We will be there when you find that you have a foundation problem damaging your home.